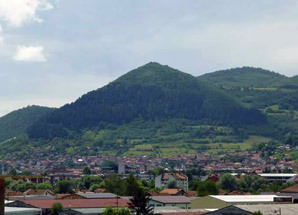 If you search ‘Bosnian Pyramids’ on Wikipedia, their report is very sceptical, claiming they are just natural hills covered in vegetation, and the whole thing is a ‘cruel hoax’. 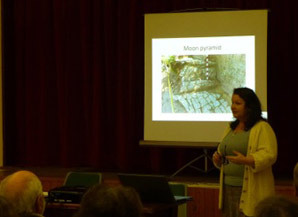 According to Lorraine Doherty during her talk about the Bosnian Pyramids on 12th February, Wikipedia seems to be a little out of date. Since they claimed these pyramids to be natural hills, extensive excavation and research has revealed a great deal of evidence to the contrary. For starters, five pyramids have been found so far - Sun, Moon, Mother Earth, Love, and Dragon. Excavation has begun in the Ravne tunnel, the entrance of which appears to be paved with unnaturally regular stones. The oval-shaped tunnel could not possibly have been eroded by the rivers nearby. Deeper inside, ceramic ‘pods’ have been discovered. They resemble megaliths, but x-rays reveal they are hollow inside. Lorraine showed us photographs of a seam around the pods where they have been sealed. The ceramic has amazed experts, who agree they have never seen such hard or strong man-made material anywhere else on earth. And if you still think this is a cruel hoax, how about the large stone that has been carved with ancient rune-like markings? Runes are still in use today, and current rune symbols are remarkably similar. The clincher for many of us is the cosmo-telluric energy (that’s ions to you and me) inside the tunnel. For comparison, the energy in the Swiss Alps measures 15,000 Bovis units. The entrance of the Ravne tunnel appears to be paved with unnaturally regular stones. Usually the deeper you go into caves or tunnels, air quality deteriorates. Here it just gets better! As you enter, you get 15,000 Bovis units. Just 15 metres in, you get 25,000 Bovis, and further in still, 40,000 Bovis have been scientifically measured. On top of the sun pyramid, a plume of energy measures 50,000 Bovis, not recommended for more than 10 minutes at a time. There is more; the inner walls of the Ravne tunnel seem to have been pebble-dashed with stones embedded with quartz crystals. Much of the interior has been deliberately filled in, and it has been a herculean task to remove it. Dating is difficult. A piece of wood found under one of the pods carbon-dated as being 34,500 years old, but that doesn’t necessarily mean that’s when the Pyramids were built. Theories abound. Was it ancient man’s healing centre? The air quality certainly suggests it. The network of rivers flowing in amongst the pyramids could have supplied enough energy to make it work. Indeed, tests on volunteers suggest the healing energy is still working today. Occasionally, we simply have to suspend our disbelief and accept that some things are beyond our comprehension. Work continues, volunteers are always needed, but sometimes, Wikipedia, absence of evidence doesn’t necessarily mean evidence of absence. Next meeting 28th February Jeff Saward on Labyrinths.